My big worry was coffee. 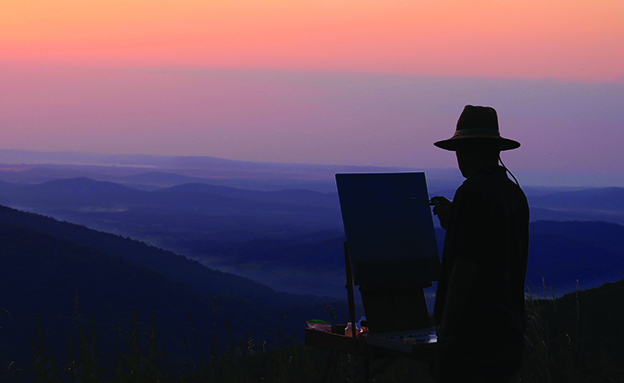 When I received the call in May telling me that I had been selected as the Artist in Residence at Shenandoah National Park for June, I wasn’t worried about what I would paint or how I would get the supplies there or even where I would sleep. I was worried about how I would make coffee. As it turned out, I probably should have worried more about windstorms. 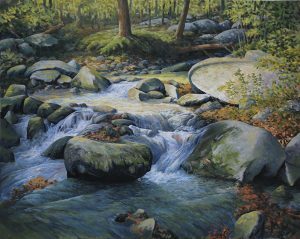 I live and keep my studio in Washington, in Rappahannock County, 11 miles from the Thornton Gap Entrance to Shenandoah National Park. Compared to folks who live in “Big” Washington, D.C., or Richmond, I already am an artist in residence at the park. This is where I live, and the park is the backdrop to almost every view I have when painting outside. Which prompts the question why I applied for this residency (housing is provided, but there is no stipend). 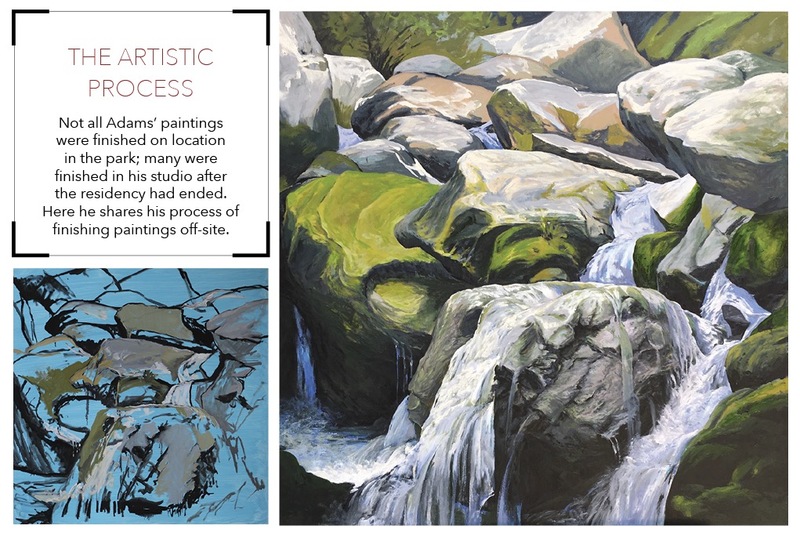 I have had the opportunity over the years to have residencies in other parks: I spent weeks painting in the backcountry of both Grand Canyon and Glacier National parks on commission for the Department of the Interior, and I also documented the Bio Bio River in Chile before construction of a dam flooded that beautiful valley. I learned from those experiences that there is no substitute for extended stays literally in the place I am painting: Being resident, in the literal sense, allows me to visit specific locations multiple times, including before dawn and after dusk, for consecutive painting sessions, and thus to see the particular landscapes in different light and weather conditions. This helped me to understand more clearly the colors, rhythms, and textures of the particular part of the park on which I was focused. Of course, being resident also means that I can slow down and study the scene in front of me, watch the changing light as it stretches and casts shadows over the mountains, and also see how both animals and humans interact with the piece of the park that has captured my attention. On the day I decided to paint at Dark Hollow and Rose River Falls, which is a pretty steep hike down, I had a 2-by-3-foot canvas and several smaller ones. A sudden storm came up and lifted the large canvass on which I was working right off the ground and started to carry it up and away when it suddenly dived instead, smacking me on the head. I grabbed it and it is now safely back in my studio, although I need to fix the area where the paint wiped off on my head as I was clinging to the canvas in the wind. This residency program is made possible by the Shenandoah National Park Trust, to which I am very grateful for this opportunity. I hope my work both inspires as art, but also that it encourages and promotes a growing advocacy for protecting and preserving our national parks and natural environment. In that regard, one of my favorite parts of my residency was painting with members of the public who happened past me while I was working. I had planned out my schedule of locations and the park not only published the “join a painter” information throughout the park, but also gave me a sandwich board to place at the trailheads when I was on location, so that the curious could find me. I will be working on this series of paintings for a long time, but hope to start showing the work at some point this fall at the Gay Street Gallery, and I will be donating one of the paintings to the park. 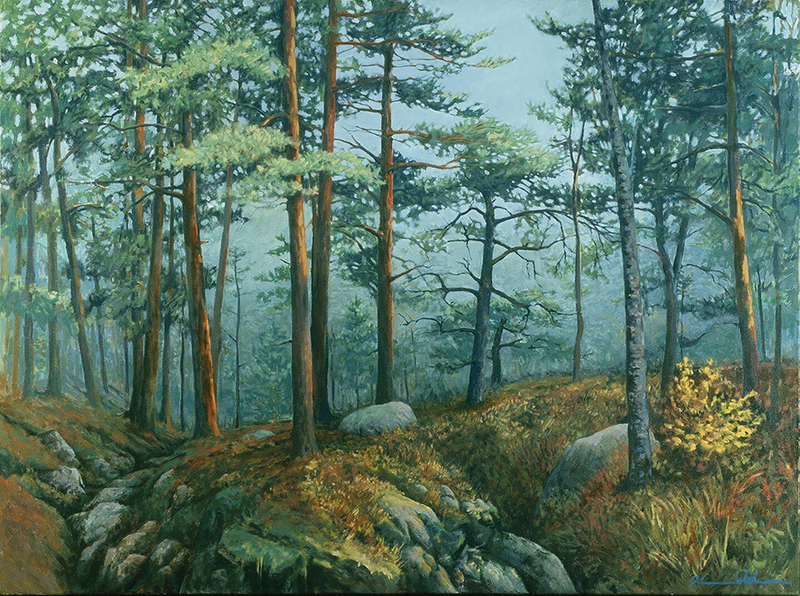 (The Shenandoah National Park Trust chose my painting “Old Rag and the Piedmont” for a limited edition print to celebrate the park’s 75th anniversary, and those prints are available now at the Gay Street Gallery—a portion of the proceeds from each sale benefits the Trust.) Please stop by; I love to talk about the residency and my work. And the coffee pot is always on.